Commonly called Japanese cedar, Cryptomeria japonica is an interesting evergreen conifer with a narrow pyramidal shape. Maturing in the 30 to 40 foot height range with a spread of up to 20 to 30 feet. The blue-green foliage often acquires a bronze cast over winter. An interesting specimen tree, Cryptomeria japonica Yoshino is an excellent choice for screening from neighbors, windbreaks and oriental and zen gardens. Cryptomeria is in the same family as the bald cypress and redwoods of North America. Water regularly for the first year planted to establish a deep root system. If necessary, apply neutral time release fertilizer in spring before new growth appears. 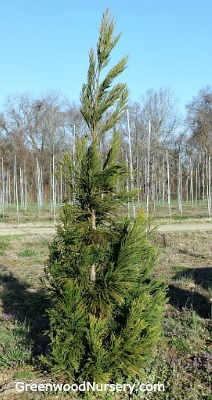 Cryptomeria Yoshino is grown in a one gallon container. Orders shipping to AZ and CA will be bare rooted before being prepped for shipping.